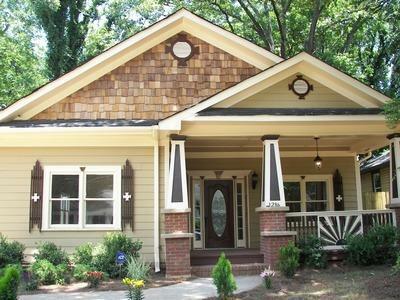 This Bungalow has a renovation that is 5 years young and is one block to the shops and restaurants of EAV. The main floor has an open concept for the entertainer. The kitchen is ample with dark stained cabs, granite and stainless. The master suite features dual vanities and tons of closets. Every closet is macked out w/ California Closet systems! There are 5 beds PLUS an office PLUS a huge den or play room upstairs. Roommates or family there is enough room for everyone. The outdoor living is just as generous w/ 2 decks, fenced yard, and rocking chair front porch. Are you looking to sale and older home in Decatur or East Atlanta? HausZwei Homes is always on the look out for older homes to purchase. We close with cash so fast and easy closing for homes for sale in Decatur and homes for sale in East Atlanta.